Does the concept of living in a single room that may be small or big, seem too confining and terrifies you? Well, with constantly evolving careers, city-hopping and ever increasing real estate costs, you might have to look at making your home in a single, mostly undivided room. This concept known popularly as the studio apartment is very successful in most of the bustling cities of the world. However in India, it is a concept that is still trying to capture homeowner’s attention. In India we like our rooms segregated, no matter the area! But emerging concepts, advances in furniture design and trendy accessories are making life in a studio apartment, a LOT of fun! So if you are looking to move into a single room apartment, here are some elements you should look at retaining regardless of the space. 1. The Living Section : Be it a single room or a four bedroom home, the living section is important. In a single room it plays even more importance, as you don’t want your home to be just the bedroom! 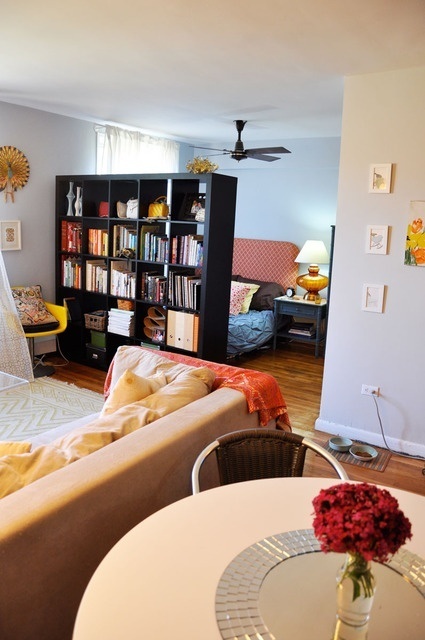 Plan the space in your mind or better yet draw a plan on paper to get the maximum from your studio apartment. The living section must have your comfort furniture such as a couch, some ottomans or a bean bag. If the space is very limited, you can opt for sofa beds. They play the role of sofa during the day and expandable to bed at night. If more space is involved, look at a couch or loveseat, they come with storage options as well. 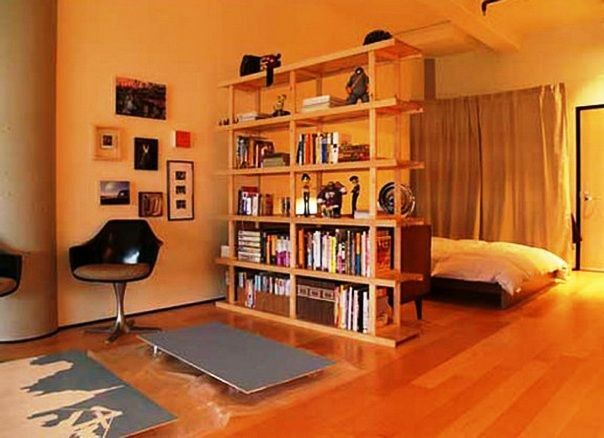 And if you don’t need storage space, clean minimalistic design will add visual space to your small home. 2. The Kitchenette : It is tough to eat out everyday, and you will want to make yourself a simple or even elaborate meal from time to time. This requires an equipped smart kitchen. Look for wall storage and collapsible options. Modular is also a great idea, especially if you need the kitchen counter fixed. However if the place is not going to be permanent for a few years, then you will have to get creative and look for cost-effective options. A kitchen cabinet and a sturdy table can comprise your kitchen and can go with you when you shift again. 3. The Study : Regardless of how small the home, I believe that working from the bed or the couch is less effective. It is always good to have a table to sit at, especially given that modern day laptop usage has given rise to many posture related health issues. A small table or a wall mount table, that can be closed and folded back, with a chair that is good use anywhere in the room , surrounded by a book cabinet makes for a practical and cozy study area. 4. The Bed : They come in all sorts of variety these days, with storage options, beautiful headboards and that can be easily dismantled while moving again and single beds that can be extended to form a double bed. If you are keen on separating the bed area from the living and other sections of the room, elements such as partitions, sheer curtains and maybe even shelves can provide a visual sense of separate areas while also ensuring privacy. 5. The Colour : Consider one bright wall in the room to cheer up the decor or you can go pastels all the way to ensure visual space. Go with what you like, do not stop at experimenting just because it is a single room. 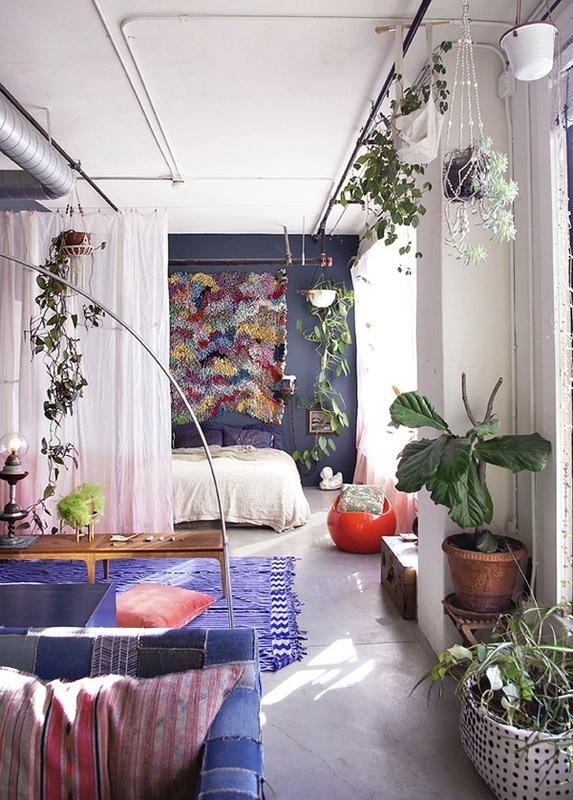 However avoid dark colours that dominate the space and make the room look claustrophobic. 6. Use The Walls : Wall mounting of shelves for storage or display, of TV and other knick knacks is a great way to liven up the space without taking up floor space. 7. The Green Influence : No matter how small the space, adding some greenery to the decor helps cheer up your home. Keeping s few small indoor plants can provide you decor as well as health benefits. 8. The Outside : If your single room apartment has a balcony or a terrace outside, make good use of this space as well, as a green spot or lounge area. If the view outside is drab and boring, dress up your windows to make it look cozy from the inside. I love the way a studio apartment was converted to a cozy and colourful home in the movie Wake Up Sid. Just watching some of the scenes in the movie where the transition is made from a raw empty space to a home makes me happy! So go ahead and create your own room of happiness!